The ‘Badger’s’ got to grips with La Siesta ‘Hornets’ in their final home game of the summer league. Winning on 5 of the 6 rinks for a total of 10 points did not indicate the closeness of the games with the final shot difference. A close run thing at 103 shots for and 97 against. A pleasant, friendly game in the hot hot sun. 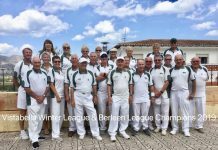 Winning rinks; Brenda Jiggins, Lynne Bryce & Geoff Paylor 23 – 12, Joel Fernandez, Derek Jiggins & Peter Dix 18 – 7, Niel West, Ben Noke & Andy Bryce 18 – 14, Dean Webb, Geoff Eggleton & Phil Warrington 20 – 17, John Hassell, Graham Richardson & John Mallet 19 – 16. Well done for a great team result. Also, we celebrated our President’s 85th Birthday with a cake and a song. Happy Birthday again Joel Fernandez. 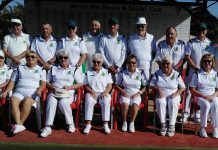 On Wednesday saw the ‘Herons’ travel to our local rivals Horadada for the final match of the VCL season. Horadada were lying middle of the table with the ‘Herons’ below so nothing to play for! A nice friendly match! No such thing, the morning proved to be very hot, not only weather wise but also on the rinks. We held it together and went out with a bang winning 9 points to 3 leaving a good feeling of a job well done. Winners; Ladies singles Brenda Jiggins 21 – 16, Men’s pairs Ben Noke & Geoff Paylor 19 – 11, Triples Lynne Bryce, Derek Jiggins & John Mallet 11 – 10. And a good point in the rinks Geoff Eggleton, Graham Richardson, Andy Bryce & Phil Warrington 12 –12. I would just like to thank all our teams for a fine effort in what was a difficult season for the ‘Herons’. With the Buckskins having a bye this week, our VCL team had the only league match, this being at San Miguel against the Marshalls. The marshals having the home advantage proved to be too strong on the day for El Rancho, despite some good all round play. El Rancho came away with one rink, that being the rinks match. Ladies singles: Diane Yates 14-21. Gents singles: Jim Gracie 8-21. Pairs: Rob Clark and John Skipper 7-23. Trips: Sheila Cox, Mike Cox and Brian Taylor 16-26. 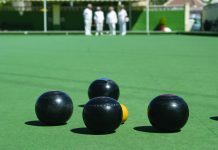 Rinks: Jean Bagwell, Sheila Cooper, David Whitworth and Carolyn Harris 18-17.For membership details contact Brian Taylor on 965077093 or at briantaylor_es@yahoo.co.uk or Carolyn Harris on 966774316 or at elranchobowls.secretary@gmail.com. 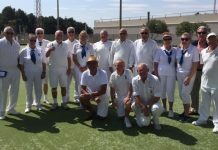 In the VCL League Greenlands Jasmines were away to La Marina, and In very hot weather both teams played their best and after a very close game it was the Jasmines who came out on top. Final score was – total shots for – 98. total shots against – 86. Points for – 10. points against – 2. Winning rinks were – Ladies Singles, Mary Lockley – 21 shots to 16. Pairs – Phil Lockley, Dave Webb – 21 shots to 18. Trips, Sandra Jones, Val Duchet, John Obrien. – 17 shots to 15. Rinks, Jean Thompson, Janet Webb, Dave Dudding, Barry Collins. – 19 shots to 16. We should all pat ourselves on the back for getting promoted last season and finishing near the top with 67 points in this league. Bodes well for next season, well done everyone. This week we were away to a strong La Siesta team, who have now caught us up in the league table. 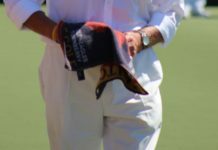 It was a disappointing result for us on a really warm day and it saw us wilt in the heat, losing the overall shots total by 123 – 86 and the match by 10 points to 4. 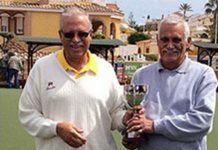 Our two winning trips were Wayne Jackson, Margaret Odell and John Hurlock by 25 – 14, Ron Odell, Jack Linehan and John Bailey by 24 – 9. The consolation was the warm welcome we received, and the friendly sporting attitude of all concerned; a good morning’s bowling enjoyed by all. We have 1 more match to play to finish the season and that is at home against the leaders San Miguel Moors. With La Siesta Wasps hot on our heels we have to do well on this last match, so no pressure then Team Horadada! Irene Graham, David Miles, Roy Thomson and Bryan Eatough 12 shots each. I have to mention our Trips represented by Peter Davis, Les Davies and Terry Hucknall. Once again, this was a hard fought match with our Guys just losing by 1 shot 11 – 10. Disappointing, but very well played. After being promoted last year we knew we were in for a rough ride playing against tough opposition but in saying that to finish 4th in the table is a good result considering the size of our club. A huge thanks to all who participated – players, reserves, markers and not forgetting the Club Captain Fred Trigwell and Vice Captain Allan Miller. 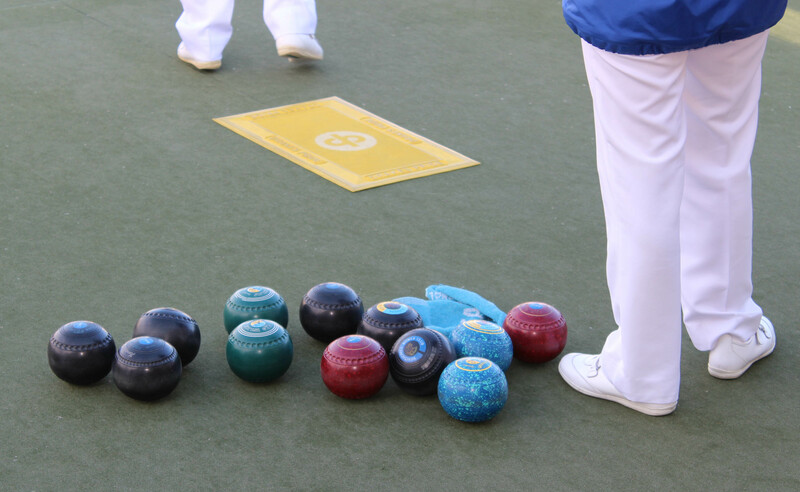 After the long drive to Country Bowls the Torros had a disappointing result winning on only two rinks. We done to the two winning rinks of Julia Hamilton, Iain Sheridan and skip Joan Harding, Howie Williams, Joe Ridley and skip Diane Ridley. Shots Torros 95 – 99 Badgers. Points Torros 4 – 10 Badgers. A tough match against the Jasmines at Greenlands. Only winning on one rink well done to Wendy Sheridan, Rod Chamberlain and skip Dave Melville. 14 – 0 and by more than seventy shots to pip the Torros for the league title. Well done to everyone who has played for the Torros during the season. Away to San Miguel for the last VCL match, the lords won on two rinks. Well done to Pauline Woodfine (singles) John Hunt and Jack Burrell skip. A big thank you to all who played for the Lords during the season. 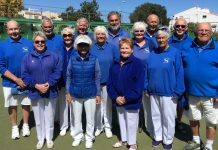 This week the Lancasters played at San Luis. As the season is coming to a close, they went in with all guns blazing and came away with 3 winning rinks against tough opponents! Well done John Cleal, Ian Forbes & Jacqui Johnston; Mel Highland, Peter Farrell & Peter Bradbury and Claire Dye, George Kershaw & Abby Benson. Another 6 points for the Lancasters. Next week, at home against Emerald Isle Victors, its all to play for in order to avoid relegation. The Blenheims are hot on the heels of San Luis with equal points at the top of the league but San Luis just edging ahead on shot difference. On a very hot day against San Miguel Christians, the Blenheims kept their cool and won 5 rinks, only just losing by 2 shots on the 6th rink. A great victory for the Blenheims with a win of 12-2 points. Watch this space for the race to the top of the league next week!! And theres plenty of tension in the VCL league as well! The Lions started the day 10 points behind San Luis with 12 points available to decide the winner of the League. 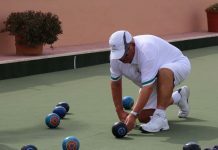 Unfortunately the task proved impossible – both the San Luis singles players winning their games, which means that San Luis has won the title. Well done to the winning rink – Derek Sale, Carol Broomfield, Caroline Smyth & Jason Prokopowycz and to the men’s pairs Del Toozer and John Smyth who drew on their rink. The Cheetahs played their final match of the season away at La Siesta. It was a particularly hot and humid day and unfortunately one of the Cheetahs members had to retire so the men’s pairs couldn’t finish their game. 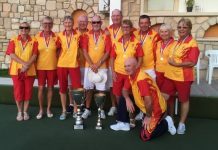 Meanwhile the Cheetahs had wins in both the mens and ladies singles by John and Dee Stephenson. The day finished with a celebration lunch at the nearby Gran China restaurant where they were joined by their colleagues QBC Tigers. With a bye for the last week of the season The Tigers finished overall winners of the league by 11 points – fantastic result! This means that the Tigers will be promoted to Division 2 of the VCL next season. Congratulations and very well done! SA Spitfire League Greenways away to the Emerald Isle Victors. Three wins each with the home side taking the points for the overall shots..wins for Pauline Rafferty, Sandra Burrows & Maggie Furness 22 -15. Rosemarie Savage, Bill Corbishley & Stuart Allman 24-19 and Mike Irwin, Carol Thorpe & Peter Whitehall 21-20 who also won a magnificent ‘Hot Shot’ on the second end! Shots, VB 108(6) – 124(8) EI. The last game is on Monday …good luck Greenways. VCL..The Vikings, after a poor start to the season sitting at the bottom of the league showed an improvement in the last few games to finish a respectable third, their last game was at home v San Miguel Sheriffs who were fighting for league survival, they finished with a draw of six points each. The Vikings had two wins and the overall shots. 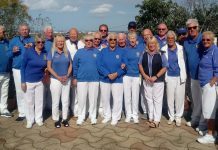 Charlie Watkins & Gary Thorpe won the Pairs 22-10 and Lynne Bishop, Jeff Neve & Carol Thorpe won the Triples 19-12. Shots, VB 84(6) – 81(6) SM. The Saxons started the season very well but the wheels started to fall off in the latter games and consequently they just failed to retain their place in A division but it was extremely close between the Saxons and the Sheriffs. 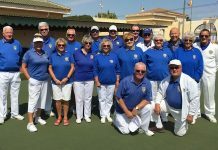 The Saxons played their final game at the Emerald Isle where they won the Ladies Singles 21-9 well done Maggie Furness and also to the Rinks team of Mike Irwin, Neil Burrows, Barbara & Arthur Brown 22-11. Shots, VB 85(6) – 76(6) EI. Now for some very good news.. I can confirm our Men’s four wood pairs team did win the league and won it handsomely, congratulations to the Captain Peter Whitehall and his team of Charlie Watkins, Del Gunning, Arthur Brown, Eric Bishop, Gary Thorpe also reserves Mike Irwin & Neil Burrows.